"Not The Episode With The Dead Dog"
First of all, the final few episodes of Futurama clearly aren't being broadcast in the production order since the title-card for "Stench and Stenchibility" was probably supposed to recall the installment that immediately preceded it not the one that aired two weeks ago. Seymour, the 'dead dog' in question, is never far from fan's minds ("Jurassic Bark" was recently voted the best of the series) but he made his emotional 'return' in "Game of Tones" while last week's "Murder on the Planet Express" parodied several horror flicks (quite well) in the name of team building. It also makes sense that the creatives would want "Stench and Stenchibility" to follow "Game of Tones" since the latter's title is a play on last night's guest star Emilia Clarke's regular series. Game of Thrones. You might have heard of it. The Khalessi was kind enough to provide her voice for the penultimate episode (single tear... more next week) that's more a play on Charlie Chaplin's City Lights than the Jane Austen novel the puntastic title suggests. Hm. Can you guess what Futurama character headline's "Stench and Stenchibility?" "I'm going to snip her off her feet!" The episode got off to a slow start and had a more traditional A-story, B-story structure than Futurama traditionally delivers. The main thread is the titular tale and follows the loveable yet foul smelling (and poor) Dr. John Zoidberg on his quest for love. He's been video-dating a horrible alien named Zindy and "Stench and Stenchibility" opens with the couple deciding to finally meet in person. And since he's put in some solid online time, Zoidberg's expecting to take Zindy home, which means the dumpster needs a good cleaning. Bender decides to lend a hand, bug bombing his crustacean friend's place and then deals with the now evicted and attacking creatures with an aggressive dance. Hello, tacked on introduction to the B-story! Randy, the show's homosexual caricature, happens to be walking by and convinces the young, roach covered robotic Gene Kelly to come to the Parks and Recreation department's Tap-Dance-A-Palooza. Even though the cause of the side-story is half-baked at best the result is increasingly hilarious, especially once Bender is pitted against the adorable and devious Tanya. I wonder how they came up with that name? But before continuing with the dance competition, let's return to Zoidberg's romantic journey since it dominated the first half of "Stench and Stenchibility." The date with Zindy doesn't go well because there's no longer all of cyber-space between them to keep his smell a secret. Catfished? You can't really blame the disgusting heap of a thing for not going out with Zoidberg, I mean, she was getting physically ill. But what about that adorable flower shop girl (voiced by Clarke) that he visiting on the way to the disappointing date? Well, when he returns to the Flowering Inferno to try and get a refund for his already extra thrifty transaction, Marianne is surprised that things didn't go well for the very nice gentleman... crab. She once again mentions her tough financial situation, probably because Zoidberg's house is stinking up the hood, before Roberto shows up with his knife (and craziness) to rob them. Still reeling from the rejection, the good Doctor decides to stop the crime but does so by surrendering himself to be stabbed. Good thing his underarm mustard gas is enough to drive the assailant away and helps him learn that Marianne has no sense of smell. (Interspecies) Soul mates? "Woo-hoo! In your dead face little girl! I'm not even going to wait to dance on your grave, I'm going to dance on your corpse right now!" Zoidberg and Marianne really hit it off during a date to a bunch of smelly spots (like Jersey) and they even spend the night together. Gross. Things are too good to be true for the perpetually unlucky crustacean which means it's time for some conflict and this comes in the form of a possible transplant to give her a sense of smell. After some bad person advice, he comes clean and shares the option with Marianne even though the delicate procedure will likely end their relationship. And I really thought it would. Fortunately, her new nose doesn't seem keen to conform to traditional ideas of what is a good smell or bad stench and she happens to like the way he stinks. So much for running the flower shop, time to get a job more suited to her senses. It was a very nice ending to a sweet thread. The B-story was not quite so sweet but was big on the laughs. Bender turns up for Tap-Dance-A-Palooza as one of five willing participants and it looks like his main competition is an adorable six year old girl with a heart condition. Bender obviously has no problem exploiting the medical problem but how far the show goes with the gag shocked me. And made me giggle uncontrollably. "Listen. I've got a new job and, well, I'm going to have to dump you." It's worth saying that satisfaction wasn't the only prize given, there was also a trophy and it doesn't take long for the field to be whittled down to two. In fact, it just takes a montage showing the blob doing (an awesome version) of the splits, Petuna dance-sitting on a chair with a smoke and the many legged alien getting tangled and then it's just Bender and Tanya. She may have Randy and the crowd fooled but Bender can see the evil behind the act. He plans to win by putting tacks in her shoes (and then kidnapping her family and making them watch him shear her head) but she beats him to the punch by pulling a Kerrigan. Bender tries to get Zoidberg to fix him up but the Doctor's busy with his own issues and this forces the robot to compete with one good leg. And then just one leg. This prompts a little antenna ingenuity but Tanya still comes out on top. Until the cute little heart attack. Seriously, I couldn't believe it what was happening (even though I saw the dance back to life coming) and I ended up combating a fit of laughter. The two make a pretty good pair and continue to pull schemes together outside the Planet Express building. It's was a nice ending and much more naturally led back to the main thread for the final word. Perhaps I'm getting sentimental (and/or forgiving) because the end is nigh but I "Stench and Stenchibility" made me feel good. 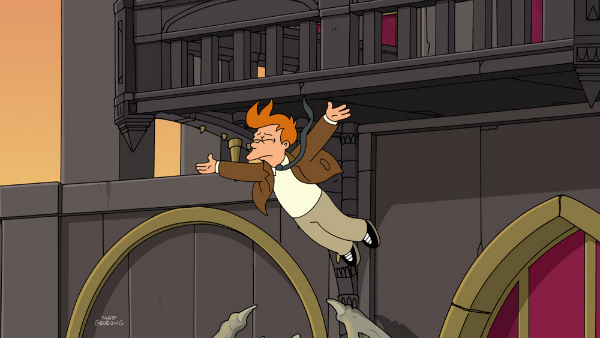 Futurama returns with the SERIES FINALE, "Meanwhile," next Wednesday at 10 p.m. ET on Comedy Central. I got see hear the first act and see the second at Comic-Con and it's really special. It's looks like they once again stuck the landing.